Once upon a time there was a shaper who (for what ever reason we will leave to your imagination) was in a very creative mood. He saw an image in his head, an idea that needed to become reality. It was the middle of the night but of course some times, you just need to get these things out an jotted down on a piece of paper, or in this case hewn out of a blank. Joshua John Dimery is a shaper we have been following for a while now, and is an actual student of surf history who loves looking at the influences of past shapes that inspire him to create something different. Being creative is part of the natural process which has been integral to the evolution of surfboards thus far. Sure, mistakes have been made but through tweaking and testing, now that’s were real magic happens. So back to the midnight creative brain discharge of Josh. Let me introduce to you… The Starsky. Sea Folk have made one of the best board bags we have seen. As your mind tries to wrap itself around the shape let me tell you that you would not be able to imagine how it would work. I know, as I make it my business to look at a board and get near to the idea of working out how such things perform. Firstly, I could not imagine this, there is just too much that’s different from a conventional board. Secondly, to see the board in the flesh is just a different thing all together. A whole lot going on everywhere. Thirdly, paddling and taking off on a wave is not what you would expect either. As I tap these keys, I have ridden the board three times and nothing is as it might seem, but more on that later. Josh and I know each other through the geeking out on surf history, designs of the past and all the other things that maybe don’t interest you. One morning he sent me a picture that you can see below. The worlds best amatuer packing by our very own Tea Boy. Cheers Rich. My first reaction was that I wanted to surf it. I mean, how do you begin to work it otherwise, but due to our geographic separation this just was not possible. I asked a mate to surf it who lived closer but nothing ever happened and the Starsky slipped through my fingers and semi out of my thoughts. About a year later, I was talking to Josh and I said I had a writer who was coming from the UK out to see me and catch up. He joked that he could bring the Starsky out for me to test. Boom. The plan was hatched. You can’t joke about that. Now, how to get a board like that to me on an Easyjet flight and not to have the tail smashed off? There must be a way… and there was. Ashamedly, I don’t travel to surf much anymore, I have lost touch with the travelling needs of a surfer and don't even own a board bag, save a few socks that have seen better days. I would require something extra special for this all to easily broken (looking at the tail) Starsky. Skating hither and thither throughout the ads and web shops in the UK to find a bag that would do the job, I hit a massive problem. None (surprisingly) had the dimensions that would cater for the red and white manta tailed prototype. The dims on the board I had were 5’9 by 24 but in reality when measured was more like 6’0 by 25”, what to do? The pointy end of business. Be sure to keep this bad boy pointing away from you. So, our writer had gone and collected the board from a very stoked Josh and it was in his garage awaiting a method of securing its condition for an Easyjet flight to Portugal. The clock was ticking, I had 2 weeks to get something sorted. Catching the scent of a board of this potential calibre soon to be under my feet had whipped me into a frenzy, I went at the problem with gusto and ended up finding two sets of humans that left me wondering why anyone would buy a board bag off the shelf again. Sea Folk belong to a family of brands (Waist High Surf Club) that offer custom built surf supplies, handmade by the sea, which include wetsuits and boards, but for now, we just needed a bag. The process of getting a custom protector really could not have been easier. Measurements were requested and given to Andy at Sea Folk, based near Bournemouth, UK, a pic of the board and then 5 days later the bag arrived in North Devon ready to have the Starsky slipped into it. The anti corrosion zip is a welcome addition. I had a few questions to ask Andy about the operation at Sea Folk for those that want to know more, here we go. SB: What exactly do you you guys offer custom made? 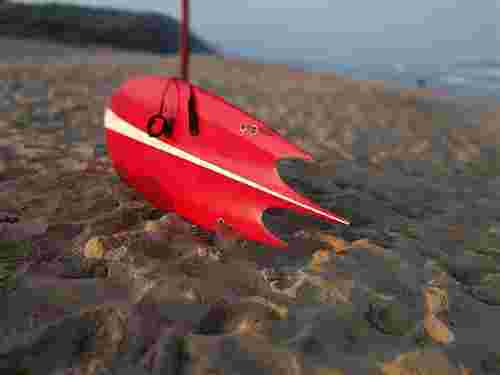 Andy: Sea Folk offer custom board bags, we also work with Chariots of the Sun wetsuits who make the best custom wetsuits, and Ahoy Surfcraft whom offer custom surfboards. SB:What made you want to start making bags and suits to order? Do you sell off the shelf too? Andy: We do sell off the shelf, stock is in and out, and we are looking to build that stock surplus. Our bag templates can be adapted to fit, and most are made to order & colour choices and thickness can be specified. We started making bags because we wanted to make premium bags for alternative craft, and offer something made in England, without all the drama of imports, which we have enjoyed in the past. In all his glory, apres surf Starsky. SB: What do you see that sets your products above buying the run of the mill board bag from one of the big companies? Andy: We offer non corrosive large plastic moulded zips and sliders, as opposed to the metal zips .. which corrode, and then break, and then get thrown away... our product is built to last. We triple stitch our bags, we edge each side individually, and then attach the two together.. which offers more durability than some. SB: Where do you source you materials to make the bags? Andy: We have various sources around the UK. some marine suppliers, some upholsters, and some material manufactures... we blend a variety of products we order from Southampton, Manchester & Glasgow and make them into board bags in Dorset. Don't even bother trying to work out the hows, we will be letting you know soon enough. SB: Where do you normally post bags to? UK, EU, World? Andy: We have shipped bags in the UK. and Europe... and also to the USA. We are particularly stoked that Mike Sordia reps one on the California coast and French stylist Margeuse, based in Biarritz, travels the world with them. SB: What is the most interesting board you have made a bag for? Is it normally easier to see the board to measure up for? Andy: The Starsky is for sure one of the most interesting boards!! It is easier when the board is with us, but we are quite used to making templates from just a few measurements. Nose, mid, tail widths, thickness and length and a pic from the top normally sort us out to get the build on. Even a Brontosaurus needs to surf every now and again. SB: When the board arrived here, there was a small amount of apprehension to say the least, what would it be like to look at, hold, surf but more importantly I suppose, would it survive the journey. It did, in perfect order. The bag itself left us wondering why you would buy an ‘off the shelf’, the zips, stitching, look and feel of the bag was incredible. We had a full range of colurs and fabric options available which is always difficult to imagine when ordering but what we got blew our expectations out of the water. Quality craftsmanship throughout all rounded off with many atheistically pleasing final touches. Not being happy to do things by halves, we decided that the ‘Starsky’ would need to be ridden by as many different surfers as possible which would mean handing it over to many different types of surfers. Everyone treats boards differently especially if they are test boards. The Starsky is visually impressive and screams ‘surf me’ and we wanted a day bag that would do not detract from the board, that would be as different as the board itself. Enter Boffle Bags by Jack Wotton. On the shaping slab. The Starsky is born. These bags are as impressive to look upon with the naked eye, hold and touch as they might seem. The material is one that is padded but also flexible and stores easily. It looks different in certain lights and also is a little bit transparent. An eye catcher whilst being functional and practical. Here are a few questions we had to ask Jack about the hows, whys and whats of the Boffle. SB: How did the whole idea for Boffle Bags come about? Jack: I have been a surfer for over ten years now and I surf mainly on the south coast of England. Most of the roads I drive down are country tracks and I like to chuck my board straight in the back of my car. I always heard a rattle and a bang, my poor surfboards always taking one for the team in the back of my car. One day on my way down to my local spot, I decided to make a bag out of this awesome padded material that a friend of mine used to make over shoulder tote bags. I thought it would be great to use that material for a surfboard bag. The intention was never to fill a gap in the market, merely to have a handmade lightweight bag that wasn’t as annoying as the average surf sock. It was at this point where I found a passion in making these bags. Fatum filmining session on the custom bags. SB: The material is something that really stands out. Can you tell us a bit about how and why you came across it? Andy: I have a friend called Mark who is an expert in textiles and he was the first person I went to for advice. He showed me this really cool 3D, lightweight material. It’s breathable which is great for a board that hasn’t dried fully. I chose green as it represents the green culture in which I see my brand heading in terms of minimal packaging and reduced waste. I also like to think the colour represents the culture of the green countryside in which the Boffle bag was born. I have had people say it’s really trippy to look and I love seeing everyone’s reaction. SB: The Boffle bag is in-between sock and bag, what do you see are the advantages of this? Jack: I found when I was off on spontaneous surf trips I just wanted to chuck my bag into the back of the car and get on my way. I found bags too bulky and a bit big for what I needed. Socks are great but they take quite a while to get on as they get stuck on all the wax. So the Boffle bag was born – the weight of a sock but quickness of a bag – also helps after those freezing winter surfs when you just can’t wait to get back into the car and put the heating on full blast! The 'Starsky' drying off after a session. SB: Custom made is awesome. How much extra work/skill goes into making the bags custom? Is it easier to see the board and measure it up? Jack: I like to make the custom fit as accurate as possible, so I have developed a process of measuring the board in a particular way so that the bag hugs the board, I would say my method is unique but works well for the bag. I had also spoken to experienced surfers and surfboard shop retailers during the developmental stages of the bag and it gave me ideas on the best standard sizes I can make as well, so I currently offer 6’0, 6’3, 6’7 and 7’0 standard sizes. SB: Where do you want Boffle to go into the future? Jack: I want to make Boffle as environmentally friendly as possible and continue to use locally sourced materials. As I grow I would love to see the bags continue to develop in technology. I am currently developing longboard bags, paddleboard bags, and paddle bags, so I hope to see all of these on the website this time next year. I would also like to have Boffle displayed in shops around the UK and if lucky, go global. This is how the bag arrived, looking very pretty indeed. Easy to store but providing a decent amount of protection. SB: What is the weirdest board you have ever made a bag for? Jack: It has to be the ‘Starsky’ shaped by Joshua John Dimery. It has an insane manta ray tail and has such a retro spin to it. I made this bag without seeing the board in the flesh but when I drew out the dimensions, I could picture the board and really image how it would surf. It was also my first bag delivered across seas to Portugal. SB: Do you get asked for boards for SUP’s and bodyboards too? Jack: I have been asked for all sorts. This is definitely one of the reasons why I am currently developing longboards and SUP bags. I have also planned to develop bodyboard bags but haven’t had any requests yet. In terms of all sorts, I have been asked for duffle bags, laptop bags, radio covers, bunting and so on. Starsky and Hutch car from the series and the later film. SB: What benefits do you see as having a custom Boffle bag over what you can buy off the shelf? Jack: I believe when buying a custom bag, someone has put time and care into the process. Being a small brand, every sale makes me happy and I love seeing people’s reaction when they get their bag. When doing a custom bag, I can account for all shapes and sizes, whereas a lot of what you can buy on the shelf is a one size fits all, so it can either leave you with a lot of excess room or over stretch of the material putting to much stress on the seams. 100% handmade in the UK by onbe pair of hands. The hands of Jack Wooton. SB: The Starsky has so far been using the Boffle Bag is its everyday attire and to be honest the bag attracts as much attention as the board. The board and the bag fit perfectly and there is enough padding to protect the board in transit through the hands of different surfers. We have had so many people ask about the bag which almost outshines the board itself. I did say almost. Back to the manta tailed beauty which is the Starsky. How does it surf? What waves is it good for? The jury is still out on that one, what I can tell you and something that everyone agrees on is that it is faster than a greased mackerel. The Boffle bag has a waffle like texture and looks different from all angles. Slightly padded for protection. It's a thumbs up from us. We will be following up on this to give you a proper dedicated article all about the combined thoughts of the multiple surfers on how the Starsky works in an article that is currently in the making. Stay safe and remember custom might be best. The Sea Folk custom board bag is a perfect fit. This is how the bag came, wrapped and beautiful looking. Filming a video review on custom board bags. Coming soon. The Boffle Bag in the Studio for a surf review filming session. Cei looking pleased with the 'feel' of the Boffle. Here he is in all his glory. Starsky.